Let me set the scene for you. I’m watching the Oscars with a group of friends. I’ve got my Oscar picks loaded up on Slate.com. The winners of categories on which I guessed incorrectly stream past my eyes. I’m not only bored to tears, I'm also filled with a sinking dread. See, my fellow Charge Shot!!! writers and I made a bet of sorts: the person with the highest score for their Oscar picks got to force the person with the lowest score to watch and review a cruddy movie for the site. As my picks kept backfiring my chances of escaping this atrocity dwindled more and more. Finally, when all was said and done, the highest score went to Chris with a resounding 20 points, and (as evidenced by this post) the lowest score went to me, with a soul-crushing -4. Yikes. And what did the gracious winner make me watch? Me, the new guy? The guy who doesn’t mind bad movies but would really rather not pay much to see one? Justin Bieber: Never Say Never. Okay, ouch. And what did the local theater show? Why, only the 3D version, of course! And who’s little sister made him drag her along to the show!? Have you guessed yet?!?! I’ll start my review with a quote from my little sister, Lizzie. I think it helps put into context why this film is doing so well. “I cried three times during the movie. First, I cried when it first started - just because it was starting…” There is a type of hysteria that follows Justin Bieber. The documentary actually attempts to explain why so many girls of so varying an age group (did I mention I also had to take my girlfriend to see it?) scream and stamp their feet over the kid. Because he started out as a little kid on youtube, so many girls feel like they were the first one to discover him. They didn’t see him on some Disney show with the rest of the world, they saw him on their computer. Also, because he’s such a twitter freak, it feels like he’s always talking to them, always keeping them in the loop. Now, about this movie. I went into it guns blazing. Sure, I like bad movies, but I thought this was just going to be concert video schlock. I was annoyed that I had to pay extra for 3D, and, honestly, it was just a rainy sunday. There were other lazy things I could have been doing. All that aside, I am loathe to admit: Never Say Never is a pretty damn good movie! I know, I know, and I was as shocked as you are. I have to come clean: I thoroughly enjoyed the movie. It’s a simple set up. The beginning half of the movie talks about Justin’s rise to fame. We see old youtube clips that, as time goes on, begin to mesh with current concert footage. We chart his rise to success through interviews with his family. This portion of the movie is like an episode of Behind the Music and it works because it’s the first story of its kind. A kid with a so-so voice posts videos on the internet and some big wigs in the entertainment industry scoop him up and make him a billionaire. Cool. My biggest complaint rests squarely on the superfluous 3D. As I suspected, it did very little to enhance the documentary. Most scenes were not in 3D, but the title cards for people speaking (like: Albert SoAndSo, Roadie) floated in the foreground. There were also plenty of shots of Justin, during a performance, reaching out to the camera and thus to us, the audience. How strange it must have seemed for the physical audience to see Justin continually attempt to grab the robotic 3D camera. 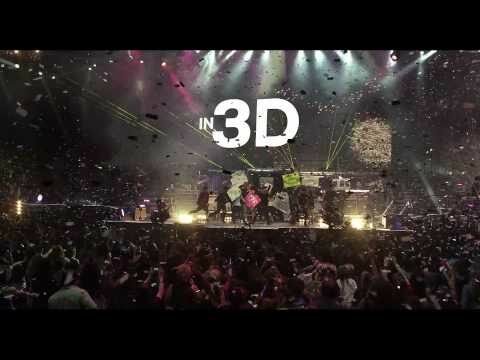 The 3D was most effective with depth of field trickery, like when it highlighted back-up dancers doing somersaults (awesome) or when, in the final scene, confetti poured out over the in-film concert crowd (and my eyes popped out of their sockets). Then of course there was a long scene of Justin, in 3D and slow motion, shaking his hair back and forth. I thought I could hear my two movie guests swoon. Was it a little long? Yes. Did Justin Bieber try to reach out and touch me in 3D a few too many times? Yes indeed! But all in all this was a well made documentary about a kid who’s meteoric rise to success has, as of yet, left him pretty normal and charming. And that hair! Good god, that hair!